This is a Singapore language test which calls for the student to write in Hanyu Pinyin the name of the animal depicted in the space beneath it. This is the type of thing that many of my strictly anglophone, yet 'Chinese', relatives in Singapore would do or at least joke about having to do when sitting (and failing) Chinese tests at school. 1. My old friend Yin Binyong used to pronounce the English word thus: "eeskweerill". 2. An old German friend remarks, "Who says Germans can't say 'squirrel'? Try 'EICHHÖRNCHEN'! What's wrong with Eichhörnchen? Try listening to the Bavarian pronunciation thereof: Oachkatzlschwoaf (here spelled phonetically) and spoken in SIX short syllables." 3. On the Taiwan Mandarin pronunciation of the flying variety, see this LL comment. Squirrel in Bavarian is just »Oachkatzl« (»Eichkatze«), the »schwoaf« is its tail (»Schweif«). Jan beat me to the above correction. I'm glad that my old German friend made that slight mistake, by adding the tail to the Bavarian squirrel, since it prompted Jan and Not a naive speaker to send in their corrections, allowing me to understand better what that loopy Bavarian word means, and even to hear it spoken by both a male and a female voice. Now I know that schwoaf is cognate with Schweif ("tail") and that katzl is cognate with katze ("cat"). But what is oach / eich? Funnily enough the Bavarian form is closer to the translation of the German word. 'Eich' from 'die Eiche' is the oak tree, in Bavarian, apparently 'oach'. Thought so, but just wanted to make sure. "Oak-cat" — makes sense! And the /l/ is a diminutive suffix ("Eichkätzlein", more idiomatically "Eichkätzchen"). Also, the number of syllables is four, not six; [oɐ̯] is a diphthong (also used for |or|). But what is oach / eich? …Except the whole thing contains several layers of folk etymology. :-) Start from a not-quite-Proto-Indo-European *ájwer- ~ *wájwer-. (With two different diminutive suffixes, the latter gives you the Slavic "squirrel" words like "Serbian" veverica and Polish wiewiórka.) Take the first alternative and apply "Seebold's law", which inserts *g into *jw clusters on the way to Proto-Germanic; and also turn the whole thing into an n-stem at some point, because why not. Then send it through Grimm's law: you get the two Proto-Germanic forms, e-grade *aikwerna- and zero-grade *aikurna-. In both, you have an "oak" followed by something meaningless. Northwest Germanic turns *u…a into *o…a. Eventually you end up with Old ~ Middle High German eichorn, which is turned by folk etymology into eichhorn, "oak + horn". Finally the whole word means something. (…The S-shaped resting position of the tail might have contributed to this, but I'm speculating here.) Anyway, turn it into a diminutive, and you get Modern Standard German Eichhörnchen. Further folk etymology replaced the "horn" by a "cat" in Bavarian. So: no cat, no horn, no oak, just a conspiracy of regular sound changes. …Also, the /a/ instead of /ɒ/ is part of the diminutive: it's umlaut. Thank you @David M, wonderful! What's more, eggcorns are a large part of ācweornas' diet. what does/did *ajwer- ~ *wajwer- mean? Apparently "squirrel", though I forgot if there's another meaning in IE branches I haven't mentioned… I'll try to look it up if nobody beats me to it. So not only have I learned something new I didn't know before from your really neat derivation, I learned something I didn't know I didn't know. Thank you very much for that. There's Latin vi:verra "ferret", Lithuanian vaiverìs "polecat, marten"; Lithuanian also has voverė "squirrel". The semantic common denominator seems to be "small mammal with a prominent tail, able to climb trees". Some forms seem to point to PIE *(w)ai-wer-, others to *we/o(:)-wer-. Perhaps these originally were two distinct animal names that got mixed up? So would I be right in thinking that the Chinese for "dinosaur" literally means "fearful dragon"? 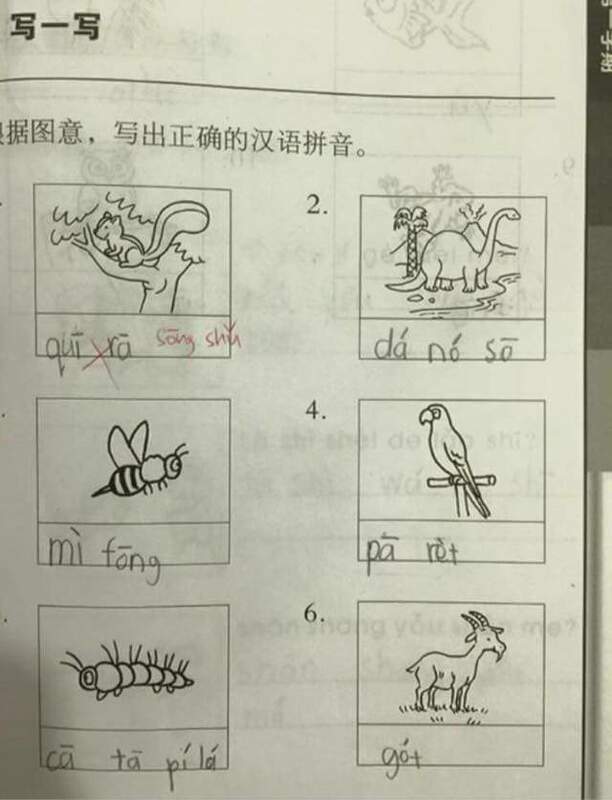 I'm curious about the student's attempt at sōngshǔ/squirrel. Is quī rā their attempt at transliterating "squirrel"? Or are they attempting some actual Mandarin word?